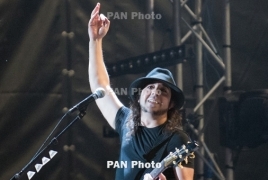 PanARMENIAN.Net - Scars On Broadway (aka Daron Malakian And Scars On Broadway) have announced the dates for an abbreviated West Coast tour that will commence in March, The PRP says. With SOAD having gone all quiet on the recording front since 2005’s double whammy of 'Mezmerize' and 'Hypnotize' (they have been touring, though), Malakian - one of SOAD's four Armenian-American members - decided to get cracking on a new project, Scars on Broadway, with SOAD drummer John Dolmayan. Now, in this follow-up to Scars on Broadway’s self-titled 2009 debut album, Malakian has gone it alone – for real. The band released their first album in ten years, “Dictator“, this past July. Rare rhino born by artificial insemination for first time ever The newborn is the first successful birth of the species as a result of induced ovulation and artificial insemination.